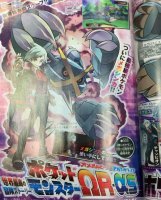 CoroCoro revealed that Steven is going to have a Mega Metagross. The scan also references the fact that new Pokémon will appear in Hoenn than before. In the UK starting on July 11th to August 10th, you will have the ability to download a Charizard holding the Charizardite that you can't naturally get in your game. There is a serial code you need, although I don't know what it is. I will post it once I find out the code. Last edited by Cat333Pokémon; July 10, 2014 at 09:22:05 AM. Nice! Can't wait for my free Mega charizard! You can also see some gym leaders at the bottom of the second page. Also, I'm happy that the UK is getting something exclusive! If u look closely at metagross hes got an extra leg/arm, so i think he might have 2-4 more legs behind him. You guys also got the Electabuzz and Magmar event too. I know the US typically gets a lot of events that some other regions don't but why the hell (sorry) do they do that? It's really not fair to anybody, anywhere. That aside, I wonder if Metagross will become the stupid-overpowered thing that it was in Black and White again, or if the lack of hold item will hurt it (hi, Garchomp). Does Metagross need a Mega? It's already amazing enough. I wanna see a mega Flygon. Not just that Steel got nerfed, but the two types that are now neutral on it are two types that are also super effective on Psychic. Coupled with the generational power creep, this makes Metagross a lot easier to take down than it used to be. I really like the direction they took with Megagross (yes, I'm calling it Megagross) as they didn't really overdo it. Based on the design it looks like it has a chance of gaining Levitate or Tough Claws as an ability. Well, I can't say I'm too thrilled with yet another powerful Pokémon getting an unnecessary boost, but I guess others are happy with it, and I like the design too, so I can't really complain. I agree that it will have levitate or.most likely tough claws. Im predicted base 165 attack 170 defense and 110 sp def... I doubt he will gain much speed but its agility sets will be pretty threatening because base 170 attack + tough claws is a free life orb boost on meteor mash zen headbutt and bullet punch. Awww, yeah! Look at that there! Tough Claws would be an interesting ability. Mega Metagross' ability was confirmed as Tough Claws. I might start using this mega But Mega metagross sounds like a monster to deal with now. Tough Claws gives it a free life orb boost (more than life orb actually) for all contact moves so it essentially gets a life orb-esque boost to all its contact moves without losing any of its HP. Even so, would still have to watch out for Sucker Punch. MMetagross would be VERY interesting to play as. Agility set could be devastating!